And so it was that we entered the pivotal final month of the season all square in points terms and all to play for over five games. First up it was a visit from Ross County. The Highlanders had been having a great season despite money troubles off the park but had finally given up on their league challenge with a run of draws. This was to prove no different as an even match ended up scoreless yet again, the third 0-0 in five home games. It was a frustrating result for players, management and fans alike but it was enough to lift us out of the bottom two on merit for the first time all season with no games in hand to cloud the equation. Although Stranraer put up an excellent fight at McDiarmid Park, their 3-2 defeat saw them slip below us. It was also the day that we finally moved officially out of range of Brechin City and confirmed a playoff place was the worst we could do. The County match was most notable though for being the day Sean O'Connor finally returned to a Queens shirt. The following Friday saw Ian McCall admit in print that he was talking to Airdrie United's Stephen Docherty about a deal for next season, quite ironic really given that Airdrie and Docherty were the following days opponents. It wasn't looking good early on at the scene of our worst performance to date under McCall. In what was probably our worst half of football since that day Airdrie dominated and could have led by more than the single Gary Twigg goal they had to show for their efforts. 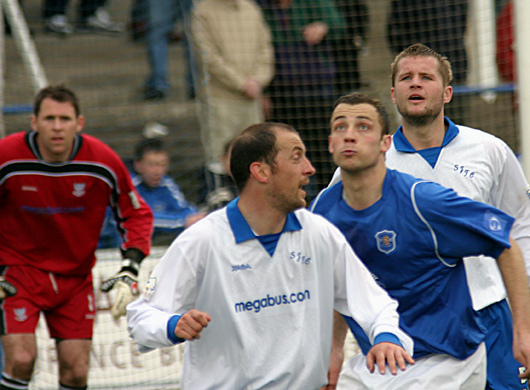 Meantime Stranraer had grabbed an early lead at home to Dundee. The day brightened up though as first Dundee produced an equaliser and then, more importantly, so did Queens. That came in the second half and was a long awaited first strike for the club from Graham Weir. The diminutive striker tapped in on the line after Sean O'Connor's powerful header had beaten Lee Hollis in the home goal. The other noteworthy point from the game was that Jim Thomson picked up a late booking that would rule him out of our final two league games. The big man had been sitting one card away from a suspension since mid-November so it had been quite some achievement to get that far into the season. Never the less, you just worried that it might be crucial. Saturday 15th April proved to be the crucial day when the gap was wrenched out to more than one game. Stranraer surrendered meekly at Airdrie to a 3-0 defeat whilst Queens produced the result of the day to best St Johnstone by 3-2. 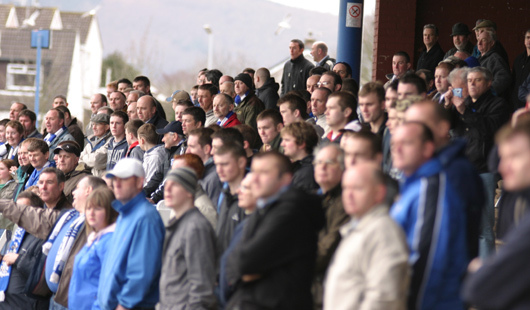 The Perth side had not lost a game previously in 2006 and the victory handed the title to St Mirren (although they did beat Dundee a few minutes later to underline it). Queens raced off to a superb start with goals from O'Neill (a penalty controversially awarded by the assistant referee after the man in the middle failed to spot it) and Weir again, whilst the visitors had Martin Hardie sent off for a kick at Gary Wood. Despite their shortage of numbers though the Saintees recovered with goals from Kevin James and Paul Sheerin hauling them level before the break. It was a tight second half but with 15 minutes left Kevin James spectacularly looped a header over his own keeper to hand us the vital points. To be honest that was all but that. With two games remaining Queens led Stranraer by 4 points, which was always likely to be enough. So it proved the following week when St Mirren's late winner confirmed Stranraer were out of range. Queens meanwhile had travelled to relegated Brechin looking to finally beat the side we hadn't even scored against ourselves all season (our goal in the previous 1-1 was an own goal). This we failed to do although we probably should have won. Sean O'Connor scored a soaring header in the first half, which ought to have been enough, but a controversial free kick given against Barnard for handling outside his box was hammered home by Stuart Callaghan. It mattered not, 400 odd Queens fans, mostly in fancy dress, celebrated a remarkable turnaround on the park with their heroes. Before the final game at home to managerless Dundee, Ian McCall began to release the names of the players who would be leaving in the summer. As well as confirming previously stated information that McLaughlin, Reid and Carr would be on their way, he also released Stuart Hill, Richie Maxwell and, perhaps most surprisingly, Colin Scott. 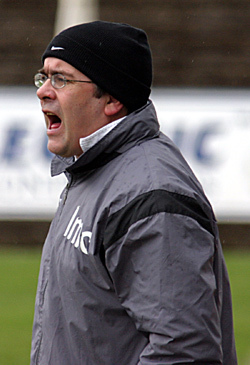 The keeper had been with the club since signing for John Connolly in October 2000 and had been a big part of the success over the previous six seasons. He will no doubt be best remembered for a vital penalty save against Hamilton Accies in the run in to our 2002 second division championship that was worth its weight in gold. With survival assured McCall chose to tinker with his line-up somewhat for the final game. There was no Bowey or O'Neill at all and Sean O'Connor, nursing a thigh problem, wasn't risked. Willie Gibson dropped to the bench and in came Andy Thomson, Michael Mullen and Tommy English for rare starts in an unusual formation involving three forwards. In addition, in a touch of sentimentality, the two Brians, Reid and McLaughlin, came in from the cold and were named on the bench to enable the crowd to give them a proper send off. Sadly it didn't work out as planned. With the Queens players clearly already thinking of an impending trip to Barcelona, a much hungrier Dundee raced to a 3-0 half time lead that could easily have been more. Embarrassed by the score the manger changed the team as much as he could at half time, which meant that although Reid was employed as a sub for the injured Gary Wood, Brian McLaughlin never did get to make his final bow from the pitch. The second half saw an improved Queens pull a goal back through Paul Burns after Tommy English's strike hit the crossbar. Derek Lyle had a shot cleared off the line also but in truth Dundee held on comfortably enough. That night Queens announced that Andy Thomson had put pen to paper on a new one year deal and, before travelling to Barcelona on Friday, McCall also confirmed he had retained the services of two young players in Gareth Campbell and Mark Whorlow. The final game also saw the retirement from service at Palmerston of two 'weel kent' faces. Vi Crawford has worked behind the scenes in the kitchen at Palmerston for over 25 years and Dr Archie Downie has also given long service to Scottish football in general and, over the last few years, to Queens in particular. They will be missed around the place and their efforts were acknowledged publicly with pre-match presentations on the park. At the end of the day then it was a season of two very much contrasting halves. We never ever looked like repeating the top half success of the previous year but, faced with a near impossible task to remain in the division, McCall and his players rolled their sleeves up and proved that the ability was there all along to compete. Just don't leave it so late next year thanks lads! Enjoy your summer.